Life in Writing: Goodbye to an old friend. Losing family isn't easy. It doesn't matter what relation they are to you: if they are gone, they leave behind a hole in your heart that can never really be filled up again. Not all family members are blood family. In fact, not all of them are even human. 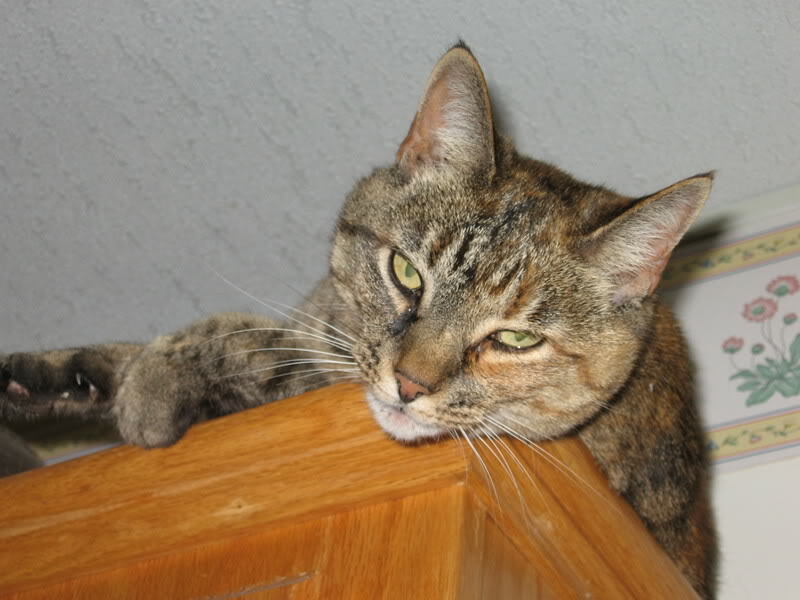 Yesterday, we lost a very dear family member: our cat, Jake (short for Jaqueline), who had been with us for fifteen years. She was old, and her heart couldn't take the strain anymore. There was nothing we could do and she wasn't in pain, she was just weak. So, Mom and Dad brought her home for the last time. She died very quietly and peacefully yesterday morning, to the sound of water from the open window. We buried her later that day in Alma, near a spot by our house where she used to go mousing. She was an indoor-outdoor cat, and she loved to hunt. Jake was very much a people cat. Her best friend was my father, whose nose she would bat with her paw in the morning to wake him up. She would follow him everywhere like a loyal dog and would scold him if he left for too long. She had a very big personality and was vocal; Jake's thoughts were never a question, and she certainly didn't need any words to let her opinions be heard. I'll never forget the last night I saw her. It was just the other night, in fact, after they had brought her home from the vet. She was so weak, and she couldn't move more than a few steps without getting tired. I approached her and saw her lying in her basket, staring off in the distance. When she heard my footfalls, her head popped out of the basket to meet my eyes. She greeted me with one of her classic meows, as if to say "You're here! You came! I'm so glad to see you! ", and she didn't sound hoarse at all, even though she was so weak. She didn't give any hint to how tired she was with those meows. They sounded reminiscent to the older days, when I would come home from school or work or university, and she would greet me the same way. I patted her and she gave the same happy purrs she would when she was healthy. I'll miss the sound of her purring. It was how I could tell which cat had just jumped on the foot of my bed when it was dark. Her brother, Mira, didn't have quite as distinct a purr as Jake's. Mira left us many years ago, a very sick cat. Jake was healthy up until about a month ago, when her heart started to fail her. She was responsive until the end, though, and her eyes would dart about wide and alert the whole time, as if she didn't want to miss a moment of it. Jake wasn't just family, she was a friend. She always knew me, even when I left for many months for university, and always greeted me the same way when she saw me: the same as when she saw me the other night. Some people would think it strange to mourn the loss of a pet so strongly, but I don't believe that. You don't need words to build a lasting bond. You don't need to speak the same language to miss the sound of someone's voice, or to be understood. In fact, sometimes the lack of language makes the communication that much stronger. It eliminates the need for words altogether. Sometimes it can make the bond that much deeper. So, thank you, Jake. Thank you for being a friend. Thank you for always being so vocal. And thank you, especially, for holding on until we could see you at the very end, and purring the whole time. Thank you for that one last fond memory I have and will never forget. To finish, I'm going to add in a poem that my father, Allan Cooper, wrote about Jake the other day, and finished yesterday after she was buried. goodbye to the last summer light. says one hair on the floor.